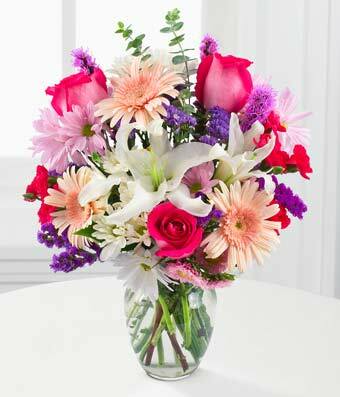 Send a loved one a sweet treat full of lilies, daisies and roses, oh my! This cheery pastel-colored bouquet with pops of vibrant hues will not disappoint! Picked fresh from the farm, this arrangement will be delivered to the recipient's doorsteps in a gift box and includes a keepsake vase. Flower freshness guaranteed.